But then I just decided to skip it and just say tada! It’s done. 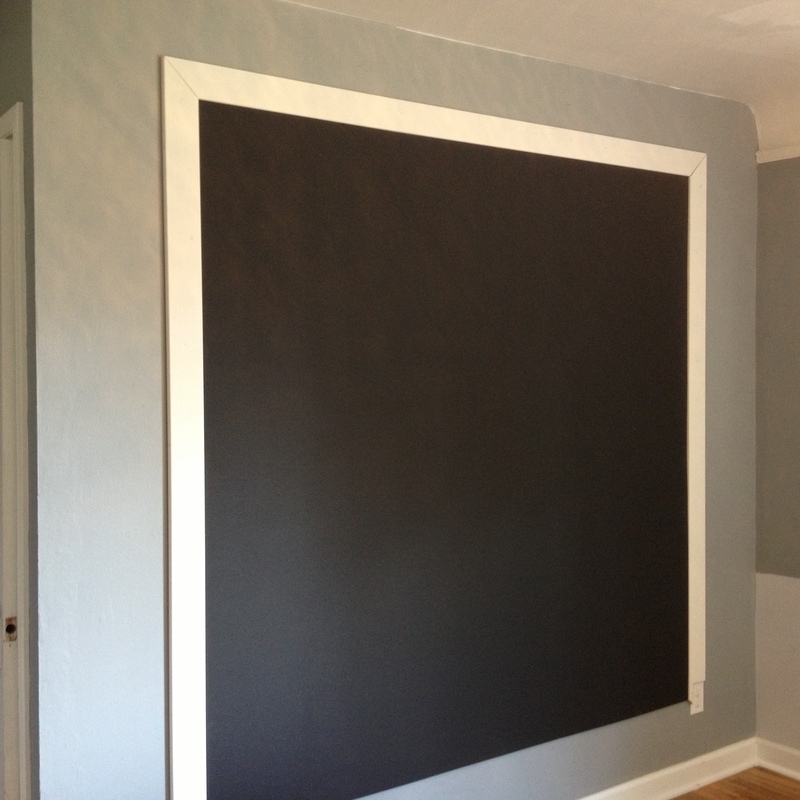 This photo pretty much sums up all my cons of having a chalkboard wall. The flags – There is a lot of pressure to do something cool, especially when there is an “event.” We had friends over for dinner who were moving away. The week prior I thought…”this will be perfect! I’ll draw flags that say “don’t go! We’ll miss you! We love you!” Then the day of rolled around. I used the majority of my energy planning the meal, going to the grocery store, and prepping everything during nap time. I got everything finished about 30 minutes before they are supposed to arrive. Then I sat down with a glass of wine, Jesse got home, and we chit chatted. Suddenly it occurred to me that I never touched “the wall!” I jumped up mid sentence, Jesse’s sentence, not mine. It’s always during Jesse’s sentences…sorry :( and ran to find some chalk. I got a few flags outlined and suddenly there were here, so the above photo is all they got. 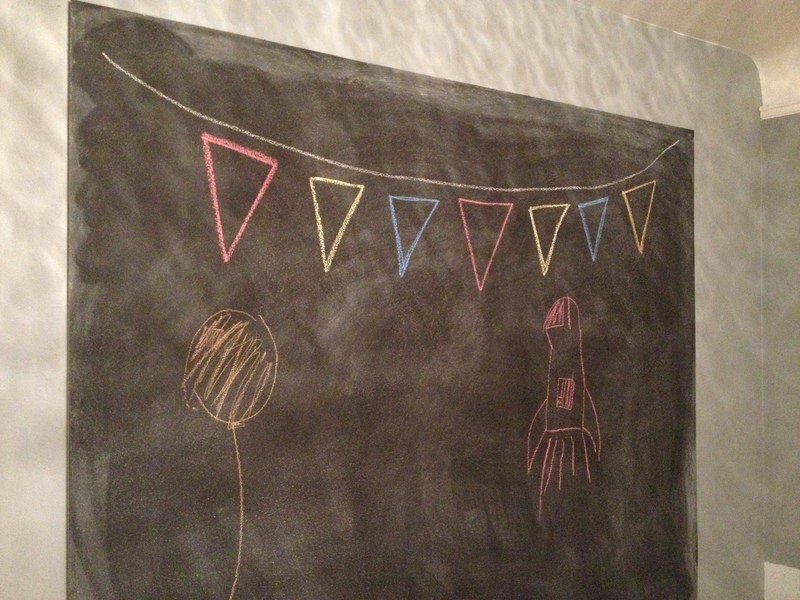 #chalkboard fail The balloon and spaceship came later in the evening. 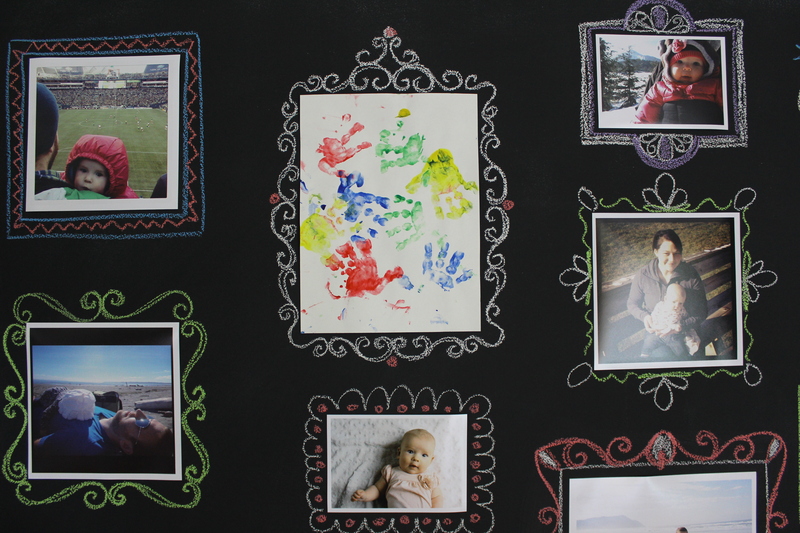 My sister is graduating next month so I’ll have another go around at the chalkboard celebration theme. 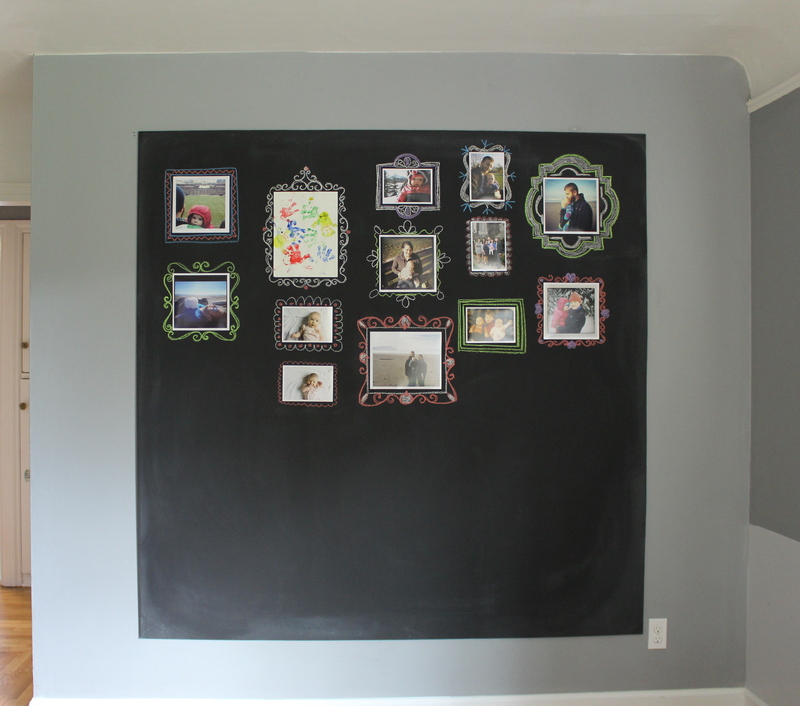 I had a bunch of printed photos, and Lucy’s lovely mother’s day art that needed to go somewhere, and this seemed so much easier than opening up the frames in our living room gallery wall. That though is going to have to get done at some point. It’s still all wedding photos that are now almost 3 years old. I’m sure our friends think by now that we are way more into our wedding than we really are. Now we are into babies! j/k…just Lucy. 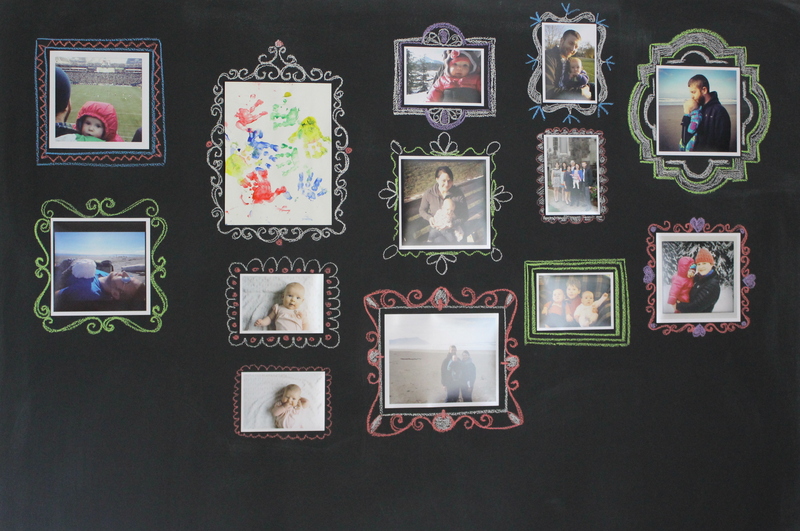 Just for fun, here is the chalkboard with the fame. It was a little awkward with the outlet. And for anyone wondering why I didn’t just paint the wall…maybe I should have, but I didn’t want to deal with the wall texture. And it seemed at the time that this would be easy to take down at some point. Though now, I have no idea where the screws are so it will probably be a challenge. I don’t know why I do these things to myself. 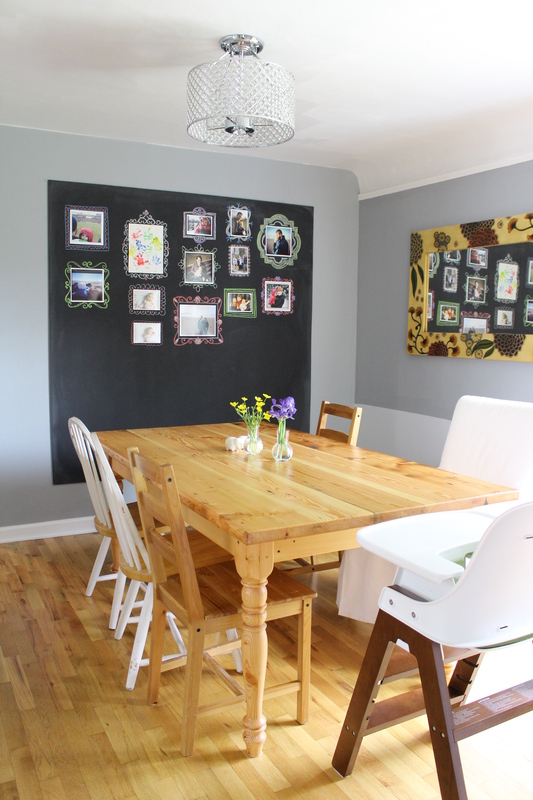 We have no plans to move, but I already am crossing my fingers that whoever buys this house next will fall in love with the chalkboard and request I keep it up and then I don’t have to deal with it. 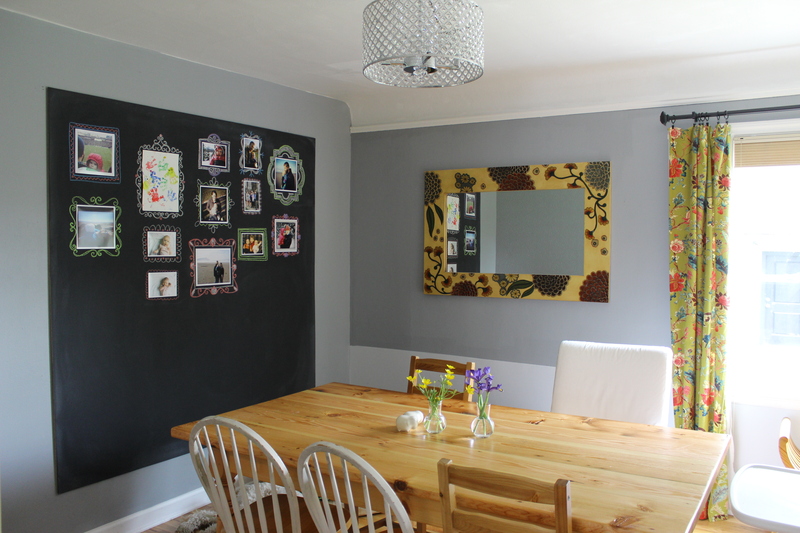 Pan out of the dining room with the chalkboard. Next up table and chairs! We got a new table, so now picking chairs. I have some different ideas, I’ll post soon.